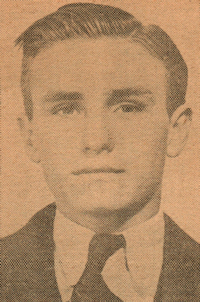 Obituary – Mieir, Robert Berry Ronald « Perry High School Alumni Association, Inc.
– son of Mr. and Mrs. W. H. Mieir, is another senior who was born in Perry and has attended the local schools during his entire school career so far. Robert was born on September 28, 1923. He is a two-year letterman in football and basketball, although he claims that swimming and baseball are his favorite pastimes. Staff Sgt. Robert B. Mieir, 22 year old son of Mr. and Mrs. William H. Mieir, 339 Holly street, was killed in action November 18 in Ardennes Forest, near Metz, France. Born September 28, 1922, he graduated from Perry High School in 1941 where he was member of National Honor Society. During his military service he was awarded Marksmanship and Expert Rifleman medals and was decorated into the Order of the Purple Heart. Two surviving brothers are in service, Pfc. Albert W. Mieir last heard from in England and Pvt. Eugene Phil Mieir who at last Journal reports was in training in Brownwood, Texas. Robert B Mieir, Staff Sergeant, U. S. Army. Home address: Perry, Noble County. William H. Mieir, Father, 339 Holly, Perry. Born September 28, 1922. Enlisted November 18, 1942. Decoration: Order of the Purple Heart. 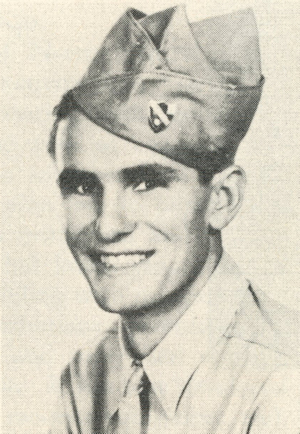 Graduated from Perry High School in 1941, where he was member of National Honor Society. Awarded Marksmanship and Expert Rifleman medals. Died: November 18, 1944, in action in Ardennes Forest, near Metz, France.